Obviously we can’t have a Senator’s aide draft the language, that would be an inexcusable normal exercise of power. The oil companies have to write our environmental laws, right? Oh wait, I forgot, Cheney’s no longer in charge. John Garamendi was right to vote against this stupid idea at the State Lands Commission, and he’s right to lead the charge against it now. In addition to the excellent points above, you can add that this is a grotesque abuse of our regulatory scheme. The State Lands Commission was empowered to make this decision, and now we’re going to pass a law that ursurps their jurisdiction, based on ZERO facts that weren’t available to the commission at the time of their decision, except for the budget crisis? This is incredible. If this is acceptable, why stop here Governor? Why not put all of California’s environmental laws, regulations, and due process on the auction block? I have no doubt we could quickly erase the structural deficit you created with your imbecilic lowering of the car tax. This “drill baby drill” scheme might play in Wasilla, but not here, not in California! Thank you Lieutenant Governor Garamendi for calling this what it is. A sham! In theory I’m not against selling or leasing State property for economic advantage. The problem seems to be we always get screwed on the deal. $1.8 Bil sounds like a big number, I wish I had the time or education to understand how they got to that figure and whether its the most we could get. I don’t think the analysis is suitable in this case since currently there is no extraction happening. Das Williams has said that it wont have any affect on our cost of gas because the price is tacked on to the oil extracted on a worldwide market. The real question here is “Is it safe?” I think the answer is yes. Slant drilling from existing wells mean there is no additional footprint, and it is proven safe technology that has been around for some time. There are other side effects. If you allow drilling there will be a decrease is seepage from natural sources. That means less oil on my feet! yea! Less natural oil slicks. Yea again. It is a sophomoric reproach that 100M is chump change. Anyone on a budget knows that EVERY PENNY COUNTS. Every expense and revenue comes to the bottom line. You just simply cant find a big hammer to swing so you have to cut everywhere, and watch ALL your pennies. Just ask all those people who stopped buying Starbucks each morning. Garamendi has been looking for some time for something to latch on to make a name for himself. I have been watching his press releases which look more and more each day like attempts to find something to be indignant about, something that incites people, something that will get people to rally behind him. Could this be it? Enough of the anger. How about being thoughtful and creative? If you aren’t part of the solution you are part of the problem. 1) Unenforceable End Dates. In the January State Lands Commission hearing the federal Minerals Management Service (MMS) stated as much. The State Attorney General has also concurred. The MMS is statutorily obligated to extract every drop of oil and gas from their leases. In 2022, if national security or whatever “peak oil” emergency requires it, the MMS could use eminent domain to keep the four platforms flowing. This deal asks the State of California to trust the good will of PXP and the Environmental Defense Center without any guarantees that federal oversight would comply with the deal. 2) The present budget calls for the overthrow of the State Lands Commission (SLC) decision of January, creates an ad-hoc commission dominated by gubernatorial appointments, instructs this commission to find that the lease is in the best interest of the state, extends the duration of drilling operations, gives the public a mere 5 days of notice prior to a hearing, and fails to include any specifics on royalty payments that are supposed to be the rationale your Administration has given for approving this lease in this most unprecedented manner. So much for checks and balances in government. If California decisionmakers want to use oil drilling to support the state, then an oil extraction tax could inject up to $1 billion dollars into state coffers this fiscal year. I guess the communists in state government in Texas, Alaska, and Oklahoma are too red for California. Instead, we the citizens should pay back the $100 million signing bonus (plus future money) to PXP with the risk of ruining our coastline, having no guarantee that the rigs would disappear. 3) Right now with the offshore drilling ban for the Outer Continental Shelf repealed, the federal Department of Interior is considering three major basins for further drilling leases: Oceanside(San Diego)-Capistrano (Orange Co), Santa Maria-Santa Barbara Co, and off Point Arena-Mendocino. Approval of this deal would set the precedent that our coasts are for sale regardless of the risk to ocean habitat, tourism, fisheries, as well as the question of sustainability regarding allowing new drilling of a resource that leads to our climate going haywire. The Department of Interior is also looking into a number of offshore renewable potential technologies. New investment should not be toward a polluting short term fix that will have no effect on energy independence. Wind, wave, and solar have some promising potentials where appropriate. The State Lands Commission, Lt. Governor Garamendi, and Controller Chiang should be supported for their principled stand to protect the interest of all Californians in denying this specious Tranquillon Ridge deal. The following letter was sent this morning. We appreciate the strong work of the State Lands Commission, Lt. Governor Garamendi and Controller Chiang. The Lt. Governor isn’t the only one with a head that’s about to explode. The 34 undersigned environmental organizations are writing to express our strong opposition to your inclusion in the budget of a proposal by Plains Exploration and Production (PXP) for the first new offshore oil lease in CA state waters in 40 years. While the precise language has not been released for legislative or public review, it is our understanding that it overrides the State Lands Commission’s legitimate denial of this project, creates an ad-hoc commission dominated by gubernatorial appointments, instructs this commission to find that the lease is in the best interest of the state, extends the duration of drilling operations, gives the public a mere 5 days of notice prior to a hearing, and fails to include any specifics on royalty payments that are supposed to be the rationale your Administration has given for approving this lease in this most unprecedented manner. Should your Administration be serious about providing additional revenue for the state budget, you have the option of imposing an oil severance tax. Imposition of this tax would provide California with close to $ 1 billion dollars in revenue in this fiscal year. Given that every oil-producing state, including Texas, Oklahoma, and Alaska have such a tax, it is inexplicable that your Administration would instead choose to opt for a $100 million advance loan from PXP that must be repaid within three years. Approval of this project via the budget fails to take into account the consequences of reversing 40 years of long-standing state policy on both new federal leasing and additional leasing in state waters. Furthermore, no Governor since the advent of the 1969 oil spill, either Republican or Democrat, has supported new offshore oil drilling in state waters. We are further dismayed by Senator Hollingsworth’s admission in his email to the Senate Republican Caucus that the goal and intent of your legislation is not to allow legitimate review of this project but to make it “impossible to stop” the approval of this project. This project was denied at the State Lands Commission based on three overriding concerns. 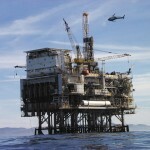 The contractual terms were secret and not available for public review, the terms of the deal were not enforceable given the Federal government’s statutory obligation to extract the resource, and the precedent it would set for additional drilling along the coast in federal and state waters. PXP has always had the right to bring their project back before the State Lands Commission. PXP has always had the right to follow existing law and attempt to cure the enforceability problems that plague its project. If you strongly support this proposal, then the appropriate way to express that support is in front of the State Lands Commission, the agency that has been entrusted with reviewing new offshore oil leases in CA state waters since 1938. We urge you to rethink this ill-advised maneuver, remove the PXP proposal from the budget, and instruct PXP to take its application back to the State Lands Commission. If they can comply with the enforceability requirements and overcome federal pre-eminence in this regard, they should attempt to do so. We understand and appreciate that you have taken several important steps over the course of your Administration to advance environmental policy. We also believe that your insistence on the approval of the first new offshore oil lease in CA state waters in 40 years via the subversion of existing California law will undo that legacy. PlanetSantaBarbara is just plain wrong to assert that oil seepage will decrease if this project goes through. The seeps are not fed by the reservoir that PXP is proposing to drill. But don’t let the facts get in the way. Hey Santa Barbara Locals – if you’re all into drilling off your coast, so am I! Enjoy the sludge on your feet and the rigs in your view. How do people opposed to oil drilling off our coast justify their use of oil and oil products? Basically, they re saying that it is OK to exploit the natural resources of 3rd world countries but not OK to exploit our own. Shouldn’t they be riding a bike or flying a hot air balloon to get around? I really don’t get it! They go on family vacations using planes that devour huge amounts of oil and don’t seem bothered by the inherent hypocrisy. The question isn’t should we drill, the question is how much do we benefit from the drilling. Otherise, stop using oil! That means no cars, trains, plains, trolleys, boats, lawn mowers, etc. and much less electricity, water, heat, hot water etc. It baffles me. Honestly. Now that Garamendi is leaving for congress, I heard Stan Statham from the California Broadcasters will be replacing him. I think this is a great idea. What are your thoughts?